I am a qualified neurologist with sub specialization in the fields of epilepsy, clinical neurophysiology, sleep medicine and traumatic brain injury. If the boxer voices complaint of headache. If the boxer is displaying overt signs of a concussion and gross motor instability (GMI). These signs include but are not limited to confusion and disorientation, impaired balance and coordination. If the boxer suffers any loss of consciousness after a KO. This boxer should not be allowed to continue even if he gets up at the count of 8. If the boxer suffers an impact seizure or displays fencing responses at the time of a KO. This boxer should not be allowed to continue even if he gets up at the count of 8. The boxer suffers loss of visual acuity during the course of a fight. This is usually on account of trauma to the eye. The boxer suffers loss or restriction of visual field during the course of a fight. This may be on account of trauma to the eye, neural mechanisms which control eye-movements or due to swelling around the eye (peri-orbital swelling). If the boxer becomes a physically compromised fighter during the course of a fight. This usually occurs on account of injury to the hands/shoulders or the lower extremity (knee or ankle injury) leading to inability to defend oneself from the opponent. Disclaimer: the views expressed above are those of the author and do not necessarily reflect the views of the New York State Athletic Commission. I go to the gym in Siri Fort Complex early morning as a part of my daily exercise routine. The goal is to remain fit and hopefully have a long innings in my life and continue to carry working in my profession as a physician neurologist. 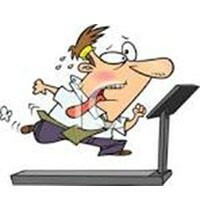 One day when I was on the treadmill I realized that I was walking rather hurriedly with short quick steps. My goal was to reach my exercise target as fast as I could. Nothing else mattered to me at that moment. I happened to look towards my right and I found a friend of mine also walking on the treadmill. He looked at ease, calm and peaceful taking long steady strides apparently enjoying his workout. On the way back home from the gym, my colleague’s calm peaceful face and long steady strides on the treadmill were itched on my mind. I tried to justify my hurried rushed style on the treadmill…I am not as tall as him nor do I have his long legs. I felt satisfied that I had met my goal on the treadmill that day. After a couple of days, I decided to try my friend’s “treadmill style of walking”. I punched in the same distance target on the treadmill, the same speed and incline but instead of taking rushed small steps, I began to walk with slow steady long strides. To my surprise after about 5 minutes, I began to feel calm and peaceful. A relaxed feeling enveloped me. On my drive back home I kept thinking what had just transpired. How did this small change of walking style create such peace and calmness in my mind? I had walked on the same treadmill the same distance the same incline and the same length of time. I had reached the same target but the peace and satisfaction was so much more. Instantly I thought cannot we apply the same analogy to life? Life is like a treadmill; call it the treadmill of life. We all have to learn to wait patiently for our turn to get on this usually fast moving treadmill. During the waiting period one has to be patient. We need to remember that opportunities will come our way sooner or later. One needs to set ones goals in life: what you want to achieve, how you plan to achieve it and at what speed you plan to go about accomplishing those goals. These goals, the speed may not be clear to us at the start but the desire to achieve those goals should certainly be there. One needs to be passionate about it. But passionate does not mean desperate. One should enjoy the ride. A wise man once said “If you don’t know where you are going, any road will lead you there.” So as we travel on the adventure called life we should enjoy the journey and the experiences which we encounter along the road. “Don’t worry about the future. Or worry, but know that worrying is as effective as trying to solve an algebra equation by chewing bubble gum. The real troubles in your life are apt to be things that never crossed your worried mind, the kind that blindside you at 4 pm on some idle Tuesday. Sometime when I go to my gym I find all the ten treadmills occupied. I have learnt to wait for my turn. There is a card posted on the fall which requests the members to be considerate of others and not to use the treadmill for more than 15 minutes at one stretch. Often I find people ignore that sign. I have learnt to be patient and wait for my turn. “When I Consider How My Light is Spent” is one of the best known of the sonnets of John Milton. The last three lines are particularly well known, although rarely quoted in context. Once your time comes and you are on the treadmill, you can choose your style (run versus walk) and your speed. If you choose to run , run only as fast as you need to. Be kind to your knees, you shall need them when you get old! Once when I entered my gym, I found only one treadmill unoccupied. I ran to occupy it before anyone else could. To my surprise it was still running. In my haste I had jumped on to a running treadmill and nearly fell. This is true for life too. Running to achieve your goals, taking short cuts does not always yield the desired results. Sometimes one falls and falls hard. In Delhi, power cuts are frequent and unexpected. My gym lacks a back-up generator. Sometimes I will be walking on the treadmill and it will come to a sudden unexpected stop when we suffer a power outage. I have learnt to be aware of this and have avoided a couple of nasty tumbles. Life too sometimes throws lemons at us, curveballs which strike us when we least expect them. A sudden unexpected loss in business or a sudden unexpected health emergency like a heart attack or stroke. Be aware of this, be humble for the higher we rise the harder we fall. The cooling off period is a very important part of my treadmill routine. The treadmill slowly decelerates, the incline gradually declines to baseline. After a vigorous work-out the cooling off period is intended to gradually lessen the impact on the muscles and the heart and to return them to their pre-exercise physiological state. One feels relaxed and has a feeling of “that was a great workout”. Similarly in life, one day retirement looms. One should anticipate this and be prepared for it. It is time to mentally and physically step off the treadmill of life but not leave it altogether! We each have to find hobbies and tasks to keep our brains occupied so that we do not slip into the throes of depression. Some among us shall choose to mount the treadmill again and find a new job, others shall dismount from the treadmill completely and choose to spend time with family and friends. The humble treadmill which we encounter in our gyms can teach us many valuable life lessons. Seizures beget seizures has been a point of contention over the years. There is some scientific evidence to suggest that each seizure increases the risk for future seizures and that failure to control seizures in a timely fashion can lead to status epilepticus (SE). Status epilepticus is a life threatening neurological emergency which can present as an exacerbation of a pre-existing seizure disorder such as in an epilepsy patient who is non-compliant with his anti-epileptic drug (AED) regimen or as the initial manifestation of a seizure disorder (epilepsy) or as the manifestation of other systemic and cerebral insults. Prolonged seizures are also associated with worse neurological outcomes. With the aim to reduce the time to treatment gap, outpatient treatment of seizures is now been explored. We discuss this approach in relation to the health care system of India. General practitioners (GPs) also referred to as primary care physicians (PCPs) form the backbone of the Indian health care delivery system. Usually, they are in solo practice working in small clinics (offices) which are ill-equipped to handle medical and surgical emergencies such as seizures and SE. As awareness about coronary artery disease has increased, GPs now feel comfortable administering aspirin and nitrates before transferring the patient to the hospital. With respect to emergency management of seizures, their knowledge and experience is more limited. If the seizure has stopped, the patient is usually referred to a neurologist. If the patient is actively seizing, the patient is referred to the nearest hospital. The time to treatment gap results in increased morbidity and mortality especially for patients presenting with SE. Unlike developed countries, India lacks a well-organized and responsive 911 type medical emergency system manned by well trained and certified emergency medical technicians (EMTs) and paramedics who can administer life-saving 1st line and 2nd line antiseizure medications such as benzodiazepines (lorazepam, diazepam) and phenytoin or fosphenytoin parenterally en-route to the hospital. We feel that antiseizure drugs in these formulations can be easily administered by a GP at the clinic without any special expertise or formal training. 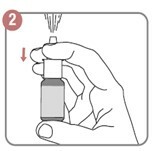 If using first time, spray it six times in the air with the nozzle pointing away from the patient until the consistent mist of the drug is delivered, this is called priming, which ensures that correct dose is delivered. If the patient is in supine position, head is slightly lifted upwards and the device should be placed near the patient’s nose. Tilt the patient head backward while spraying, this will avoid swallowing of the solution. Reprime the device for subsequent use if the bottle is not used for more than a day. To reprime spray it two to three times in the air until a fine mist appears. For reusing the device nozzle and dust cap must be washed before storage. Figure 1. Method of administration of intranasal midazolam. Each nasal spray delivers either 1.25mg or 0.5mg of midazolam. Dose is titrated according to individual patient weight and full effective dose should be administered. For adults, dose is 5 mg if weight <50 kg and 10 mg if weight>50 kg. The dose should be equally divided and administered into each nostril. For children the recommended dose of MIDACIP nasal spray is 0.2 mg/kg body weight. The dose should be equally divided and administered into each nostril. Placing half the medication in each nostril reduces the volume while doubling the available surface area for absorption. Intramuscular midazolam and fosphenytoin: GPs by virtue of their training can administer intramuscular injections with ease. In India intramuscular midazolam (MIDAZ, Abbott Healthcare or FULSED, Ranbaxy Laboratories) injections are widely available and cost effective. Midazolam is given intramuscularly at the dose of 10mg once or 0.2mg/kg once but not exceeding 10mg. Intramuscular fosphenytoin formulations are also available (Fosolin, Zydus Cadila Healthcare or Fosphen, Intas Pharmaceuticals) but more expensive. These preparations are available as ampoules of 150mg (75mg/ml, 2ml). It is our recommendation that the GP administer 2 ampoules of fosphenytoin stat in the clinic prior to transporting the patient to the hospital. Doing so may abort the seizure and possibly terminate the SE. 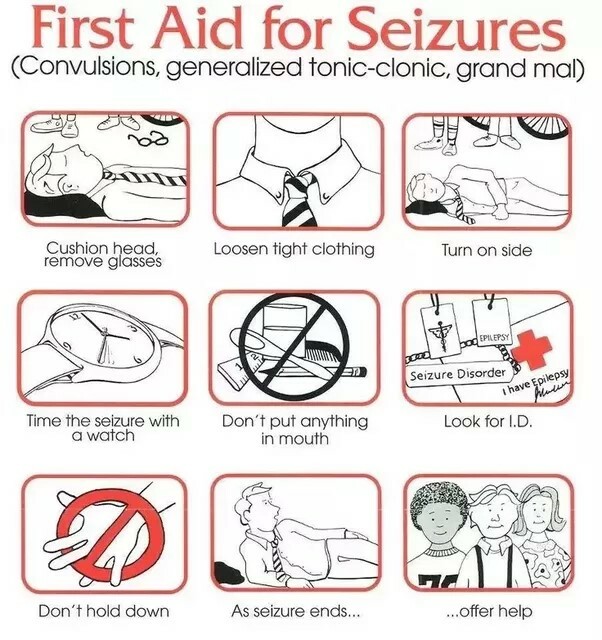 Use of the above formulations in the clinic setting by the GP along with established seizure first aid guidelines (Figure 2) has the potential to save many lives and reduce the morbidity from seizures and SE in our country. Brophy GM, Bell R, Claassen J, et al. Guidelines for the evaluation and management of status epilepticus. Neurocrit Care 2012; 17:3–23. Agarwal SK, Cloyd JC. Development of benzodiazepines for out-of-hospital management of seizure emergencies. Neurol Clin Pract. 2015; 5:80-85. Department of Neurology, New York Presbyterian Hospital Weill Cornell Medical Center, New York, U.S.A. The 2012 Zurich Consensus Statement defined concussion as a complex pathophysiological process affecting the brain induced by biomechanical forces. Concussive and post-concussion symptoms are currently thought to reflect a functional rather than structural disturbance typically resolving spontaneously with no imaging abnormality. The majority of patients with concussion recover within a 7-to-10 day period, in some symptoms persist beyond the 1 month generally accepted time frame for recovery. Some patients recover within the above generally accepted time frame but show reemergence of concussion symptoms after minor head bumps. Two such cases in amateur athletes are reported here. A 34-year-old right handed lacrosse player suffered a mild grade of concussion about 1 year ago when while playing, he was struck on the head by an opponent’s stick. No immediate loss of consciousness was reported. He experienced headache and light headedness for 1 day with spontaneous resolution. After a month, there was sudden reappearance of headache. His physician ordered MRI brain and MRA brain, both of which were reported normal. Headaches again self-resolved. Since then he reports headache only when he bumps his head into something, usually a trivial bump or when he exercises. A 64-year-old right handed amateur skier reported slipping and falling on ice about 8 years ago. Landed on his head and said he was “out” for about 15-30 seconds. When he came to, he felt nauseated. Next day consulted a neurologist. CT scan head was normal. Went back to work after 1 week. Since then every time he bumps his head, symptoms of nausea, feeling like he is in a funk, light and sound sensitivity return. Sometimes these last for about 1 week with spontaneous resolution. Consulted a neurologist, migraine was suspected and he was prescribed anti-migraine medication which didn’t work. The 2012 Zurich Consensus Statement defines concussion as a complex pathophysiological process affecting the brain triggered by biomechanical forces. 1Typically most people recover from a concussion within 2 weeks of the injury. In about 10 to 20 percent of cases symptoms of concussion may persist longer. Post-concussion syndrome (PCS) refers to the persistence of concussion symptoms beyond the acute post-injury period and includes a constellation of disparate symptoms such as headache, nausea, dizziness, attention and concentration problems, impairment of short term memory, a sensation of fatigue (both physical and mental), light and sound sensitivity, irritability, insomnia and emotional liability. 2, 3 Studies have identified older age, high initial concussion symptom load, duration of loss of consciousness and post-traumatic amnesia, pre-existing anxiety and depression as predictors of persistent PCS.4, 5 The reemergence of remote concussion symptoms after minor head bumps has not been reported in the medical literature. These are patients who report typical concussion symptoms following head trauma which typically resolve within the normal time frame of acute post-injury period. However these asymptomatic patients periodically report the reemergence of their remote concussion symptoms with the inciting trigger typically reported to be a minor bump to the head or some other cognitive or physical stressor such as going to a rock concert or an increase of stress at work or home. The underlying etiopathogenesis of this phenomena remains largely enigmatic and speculative. Whether this is a variant of persistent PCS is unclear.4, 5 While in persistent PCS there is usually no return to baseline after the inciting concussion event, the patients reported have reemergence of their remote concussion symptoms only following a minor head trauma typically low velocity and low intensity bumps to the head with return to pre-morbid baseline and functioning in-between. Underlying migraine predisposition has also been postulated as one possible etiology. 6, 7 While this is a viable hypothesis, the patients reported above had no pre-morbid migraine symptomatology (no headaches prior to the concussion). They also lacked the typical prodrome, ictal and postictal symptomatology of either classical or common migraine attacks. The third explanation for the reported phenomena is that it is a manifestation of a conversion disorder (neurologic symptoms or deficits that develop unconsciously and nonvolitionally and usually involve motor or sensory function). The reemergence of the remote concussion symptoms is incompatible with known pathophysiologic mechanisms or anatomic pathways. The onset, exacerbation, maintenance or reemergence of these symptoms is likely directly attributable to mental factors, such as stress and anxiety. The treatment involves reassurance after judicious diagnostic testing to rule out any organic etiology. McCrory P, Meeuwisse WH, Aubry M, Cantu B, Dvoøák J, Echemendia RJ, Engebretsen L, Johnston K, Kutcher JS, Raftery M, Sills A, Benson BW, Davis GA, Ellenbogen RG, Guskiewicz K, Herring SA, Iverson GL, Jordan BD, Kissick J, McCrea M, McIntosh AS, Maddocks D, Makdissi M, Purcell L, Putukian M, Schneider K, Tator CH, Turner M. Consensus statement on concussion in sport: The 4th International Conference on Concussion in Sport held in Zurich, November 2012.British Journal of Sports Medicine. 2013; 47(5):250–258. Leddy J, Sandhu H, Sodi V, Baker J, Willer B. Rehabilitation of concussion and post-concussion syndrome. Sports Health: A Multidisciplinary Approach. 2012; 4(2):147–154. Makdissi M, Darby D, Maruff P, Ugoni A, Brukner P, McCrory PR. Natural history of concussion in sport: Markers of severity and implications for management. American Journal of Sports Medicine. 2010; 38(3):464–471. Makdissi M, Cantu RC, Johnston KM, McCrory P, Meeuwisse WH. The difficult concussion patient: What is the best approach to investigation and management of persistent (>10 days) postconcussive symptoms. British Journal of Sports Medicine. 2013; 47(5):308–313. McCrea M, Guskiewicz K, Randolph C, Barr WB, Hammeke TA, Marshall SW, Powell MR, Woo Ahn K, Wang Y, Kelly JP. Incidence, clinical course, and predictors of prolonged recovery time following sport-related concussion in high school and college athletes.Journal of the International Neuropsychological Society. 2013; 19(1):22–33. Mihalik JP, Register-Mihalik J, Kerr ZY, Marshall SW, McCrea MC, Guskiewicz KM. Recovery of posttraumatic migraine characteristics in patients after mild traumatic brain injury.American Journal of Sports Medicine. 2013; 41(7):1490–1496. Weiss HD, Stern BJ, Goldberg J. Post-traumatic migraine: Chronic migraine precipitated by minor head or neck trauma. Headache. 1991; 31(7):451–456.